Condition is Used. Hard drive has a keypad on it. You can reset it for your own use. Military Grade 256-bit AES XTS Hardware Encryption: All data is encrypted on-the-fly with built-in 256-bit AES XTS.Software-Free Design: The Aegis Secure Key is ready to use right out of the box-no software, no drivers, no updates. Trending at $81.58eBay determines this price through a machine learned model of the product's sale prices within the last 90 days. Apricorn’s Aegis Secure Key 3.0 brings a world of advanced data security to your fingertips. This easy to use USB 3.0 flash drive incorporates PIN access with military grade 256-bit AES hardware encryption. Look no further than the Aegis Padlock 3.0, the latest and fastest of Apricorn's Secure Drive line. Buffer: 8 MB. Portable Security for your Data at the Speed of USB 3.0. Host Interface: USB 3.0. Drive Performance. How long does it generally take to process an order?. Opened Software. Drones - All defects can be handled under the manufacturer's warranty. Apple iPods. A/V Furniture. Restricted products include. Catalog #: APRASK330GB. How long does it generally take to process an order?. Drones - All defects can be handled under the manufacturer's warranty. The manufacturer will generally repair or replace the item so long as it is under warranty. Apricorn Aegis Padlock Pro A25-PLe256-250. Condition is New. Shipped with USPS First Class Package. Software-Free Design: The Aegis Secure Key is ready to use right out of the box-no software, no drivers, no updates. It can even be utilized where no keyboard is present. Software-free, cross-platform compatible, Aegis Configu-rator Compatible, plus a host of high-level security features. Manufacturer: Apricorn. Notes: S/N: A5G100544 | HDD S/N: 0010100740060849b | Wiped, not Formatted | Reset to Factory Defaults | HDD Grade A. All manufacturers' warranties are void unless otherwise stated. Aegis Secure Key 3z Merges Advanced Data Protection, Affordability, and Mass Configurability Easy to use USB 3.0 flash drive with on-the-fly 256-bit AES hardware encryption, onboard secure PIN access and FIPS 140-2 Level 3 validation. With the software-free operation, cross-platform compatibility, USB 3.0 speed, Aegis Configurator compatibility, and our most advanced security feature set, Apricorn’s Aegis Secure Key 3z takes advanced data security to a new level of efficiency and affordability. Product Type: USB flash drive Storage Capacity: 64 GB Hardware Encryption: Yes Encryption Algorithm: FIPS 140-2 Level 3, 256-bit AES-XTS Compatibility: Non-specific Read Rate: Up to 190 MB/s Write Rate: Up to 80 MB/s Interface Type: USB 3. Condition is New in Sealed Box. Trending at $181.50eBay determines this price through a machine learned model of the product's sale prices within the last 90 days. 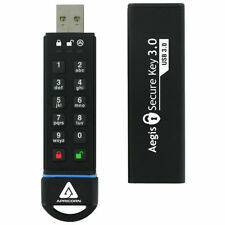 New Apricorn Aegis Secure Key 3.0 - USB 3.0 Flash Drive ASK3-120GB. Condition is New. Shipped with USPS First Class Package. Hardware encrypted drive. Super fast USB 3.0 Connection - Data transfer speeds up to 10X faster than USB 2. Sealed from Physical Attacks by Tough Epoxy Coating. Brute Force Self Destruct Feature. Wear Resistant Key Pad. It uses CBC mode of AES (Advanced Standard Encryption) which is accepted by NIST and NSA for use of critical data. Encryption is on-the-fly, always and transparent. User password to prevent unauthorized access. Look no further than the Aegis Padlock 3.0, the latest and fastest of Apricorn's Secure Drive line. Manufacturer: Apricorn, Inc. Aegis Padlock A25-3PL256-1000 Hard Drive with Integrated USB 3.0 Cable. This easy to use USB 3.0 flash drive incorporates PIN access with military grade 256-bit AES hardware encryption. Aegis Secure Key 3.0 Brings a World of Advanced Data Protection. 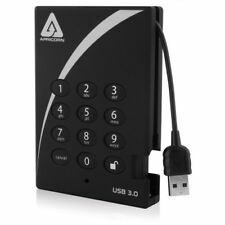 Software-Free, 100% hardware-based 256-bit AES XTS encrypted, onboard keypad PIN authenticated, and ultra-fast USB 3.1 (3.0) data transfer speeds. All internal componentry is protected from physical tampering with a layer of hardened epoxy, and locked-down firmware brings immunity to malware attacks such as BadUSB. This easy to use USB 3.0 flash drive incorporates PIN access with military grade 256-bit AES hardware encryption. Manufacturer: Apricorn, Inc. Encryption Standard: 256-bit AES. Aegis Secure Key 3.0 Brings a World of Advanced Data Protection. Aegis a25-3pl256-1000. Original box included. This easy to use USB 3.0 flash drive incorporates PIN access with military grade 256-bit AES hardware encryption. Utilizes Military Grade 256-bit AES XTS Hardware EncryptionAll data on the Aegis Secure Key is encrypted on the fly with the built-in 256-bit AES XTS hardware encryption. The Padlock DT's security policy is located on the NIST site at the following link. Software-Free, 100% hardware-based 256-bit AES XTS encrypted, onboard keypad PIN authenticated, and ultra-fast USB 3.1 (3.0) data transfer speeds. Sporting an easy-to-use keypad design that is impervious to dust and grit, with a software free setup and operation, the Aegis Padlock Fortress enables you to access the drive simply and easily with your own unique PIN. 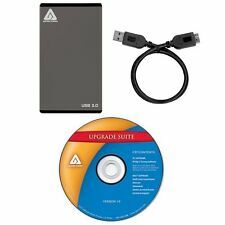 Apricorn SATA Wire Notebook Hard Drive Upgrade Kit with USB 3.0 Connection GRY. Shipped with USPS Retail Ground. Trending at $22.24eBay determines this price through a machine learned model of the product's sale prices within the last 90 days. This easy to use USB 3.0 flash drive incorporates PIN access with military grade 256-bit AES XTS hardware encryption. Manufacturer: Apricorn, Inc. Encryption Standard: 256-bit AES. Product Type: Flash Drive. Apricorn Secure Key 3z - USB 3.1 Flash Drive-128GB - 128 GB - USB 3.1 - Aluminum - 256-bit AES. Manufacturer Apricorn, Inc. Product Type Flash Drive. Interfaces/Ports Host Interface USB 3.1. Manufacturers change colors and item details frequently and often do not update pictures. Manufacturer: Apricorn, Inc. Military Grade 256-bit AES XTS Hardware Encryption All data is encrypted on-the-fly with built-in 256-bit AES XTS. Encryption Standard: 256-bit AES. Software-Free Design: The Aegis Secure Key is ready to use right out of the box-no software, no drivers, no updates. Product Title Apricorn 8GB Aegis Secure Key 3z USB 3.0 Flash Drive (ASK3Z8GB). Marketing Information The Next Big Thing in Advanced Data Protection. Military Grade 256-bit AES XTS Hardware Encryption: All data is encrypted on-the-fly with built-in 256-bit AES XTS. 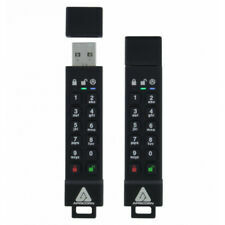 This easy to use USB 3.0 flash drive incorporates PIN access with military grade 256-bit AES XTS hardware encryption. The embedded keypad prevents hardware and software key logging attempts to capture your password entered via the host system. Quantity 1- Apricorn Aegis Padlock DT 256-bit USB 3.0 Hard Drive (ADT-3PL256-2000). New (Other)- Everything is still in its plastic wrap in the box in new condition. What you get. Look no further than the Aegis Padlock 3.0, the latest and fastest of Apricorn's Secure Drive line. 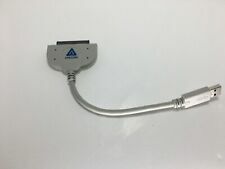 Manufacturer: Apricorn, Inc. Aegis Padlock A25-3PL256-500 Hard Drive with Integrated USB 3.0 Cable. 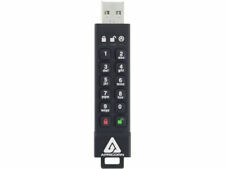 Apricorn 16GB Aegis Secure Key USB 3.0 Flash Drive - 16 GBUSB 3.0 - 256-bit AES. Manufacturer: Apricorn, Inc. Encryption Standard: 256-bit AES. Storage Capacity: 16 GB. Product Line: Aegis Secure Key. Look no further than the Aegis Padlock 3.0, the latest and fastest of Apricorn's Secure Drive line. For Sale: Lot of 3 Apricorn Aegis Portable External Hard Drive 160 GB USB 2.0. 160 GB of storage. Rugged shock mounting. Integrated USB cable. APRICORN EZ Bus PORTABLE BACKUP Drive, includes USB cable but no manual or case. Lightly used - works perfectly! Only selling because I upgraded to a larger capacity drive.